Even a Jackass like me-The Accidental Gardener – Dancing in the rain! I always envied the blooms of my grandmothers flowers. 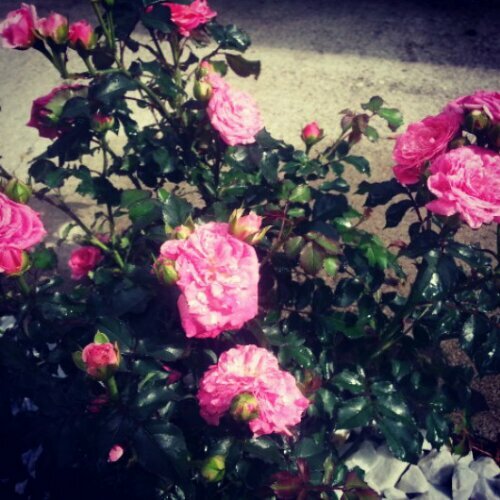 Especially the wild pink roses with that intoxicating scent that whispered summer. I convinced my younger cousins that though we may never have “green thumbs” we could be the producers of great perfume. Armed with the spirit of the young, crumbled wild roses from the bushes that lined Grammy Millers lane, her plastic pepsi cups and some tap water we were passionate about capturing that earthy, heady smell for all to enjoy. I am quite certain our parents didn’t share in our enthusiasm but Grammy Miller graciously held out her wrist batch after batch to test it, told us it smelled glorious and encouraged our thriving ambitions. When we bought our first home I was excited to build on the landscaping that was started but it turned out to be a dying, overgrown mess. We opted that first year to clean up only and as a quick fix to the fast growing country weeds we put a thick plastic sheet down and mulched over top around the hedges in the front beds. This proved to be a nightmare when we attracted a den of snakes that would mingle underneath the plastic where it was toasty warm, slither across my walkway and get inside my front door. I had a huge property that would have been a gardeners dream but my fear of snakes paralyzed me from ever attempting to enjoy it. We bought our house in Edmonton a couple of summers ago. They had a vegetable garden planted and mature fruit trees and herbs but very little perennials. The difference between perennials and annuals always confused me and it now confuses my daughters. They are anxious for the quick color fix that annuals bring but in my advancing age I think there is more to learn from sustenance and longevity and it has been a fun lesson in patience for all of us. Alas my love of house plants spilled over to the outdoors. 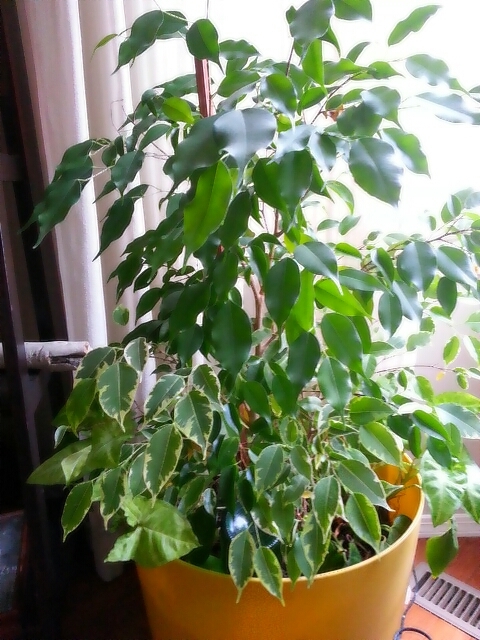 I actually have some indoor tropicals that I move outside in the summer, it strengthens them and sparks a fall/winter growth spurt. I had a daydream one day about a rose garden path, or it may have been an envious longing while looking at a gardeners magazine my husband bought me to read during a long road trip. I was told by countless people that roses were difficult but my childhood love of roses and my lack of good sence prevailed. I did however not want to spend a lot of money in case my venture failed miserably. I opted for bare root roses which had no foliage whatsoever. I started them on a windowsill in late April. I planted them after the lost frost, using our own rich soil, some compost and a little peat moss. I planted the roses a little lower then the rootball to keep them warm and put beside each one a fertilizer spike from Rona. Each day I filled my coffee press with warm water, leaving my used coffee grinds in, I stirred and watered my roses with them. Most of them bloomed that first year in July. Being an accidental gardener I didn’t cut them back or cover them in time and when I came back from my late October vacation we had already had two snowfalls. I just crossed my fingers and they all came back except one. 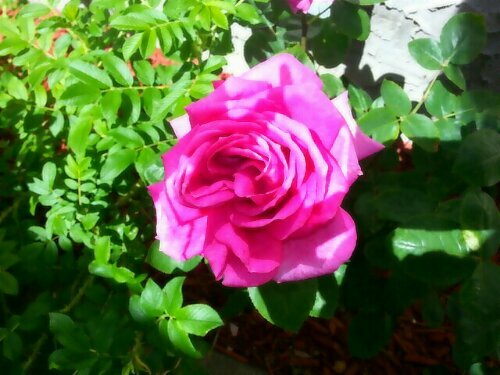 When my granddaughter Gracie was born I bought her her own rose bush. 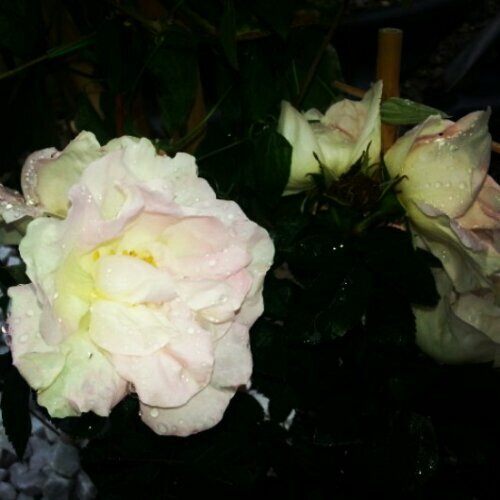 I tended the young root rose inside till after last frost. It didn’t occur to me not to plant the bush in the same location as the failed bush or at least to use new soil. I am admittedly not a girl with a “green thumb” just a girl with a garden spade and a dream. The rose seemed to shock immediately. It’s delicate limbs turned from brown to black. 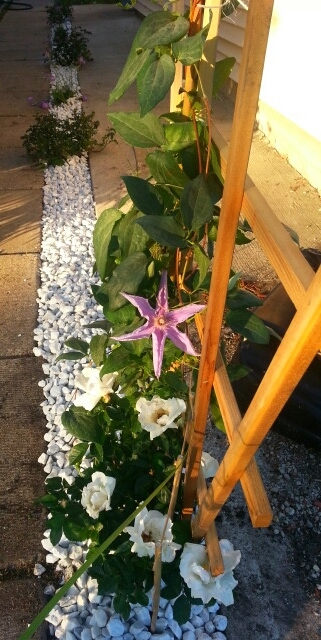 My initial thought was to yank it but because I had labeled it Gracies rose I wanted to dedicate some time to it. Daily I cut back a tiny bit more of the limbs. I scratched the bottom close to the root and noticed green beneath the surface so I felt hopeful. Twice a day I fed Gracies rose bush strong black coffee and I am proud to say that she is doing well. I am so excited to see her bloom next year. 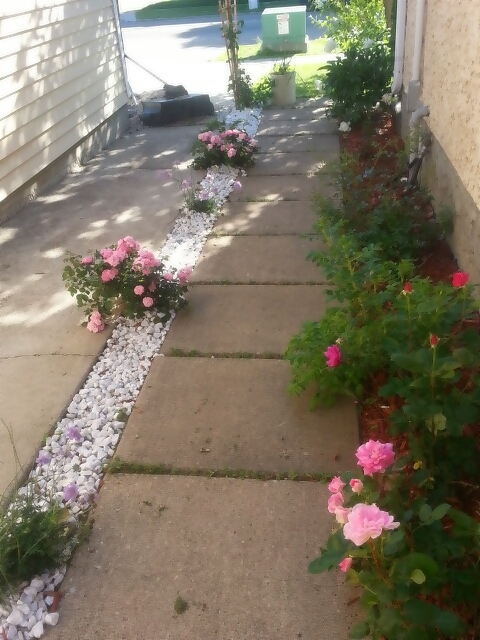 My daughter and I planted the other side of the garden path this year with beautiful pink drift roses and lavender. This year I will cut them all back and cover them. I figure if I can do really well with minimal effort why not up the ante? I urge anyone who appreciates a nice garden to try your hand at gardening. I find myself planning next year and for years down the road. To call me a gardener would insult actual gardeners. I am just a girl who would rather plant and tend flowers then do laundry. It is very satisfying to watch a plant erupt from underground to full bloom, raised by the motherly love of me and the sun. Where nature meets nurture. That’s our Mom for you, always encouraging no matter what. God, some days I miss her so bad! Your garden is beautiful, and I definitely think you have a green thumb, plus the knowledge to get it done! If only we could go back in time, even for a day, an hour or a minute. 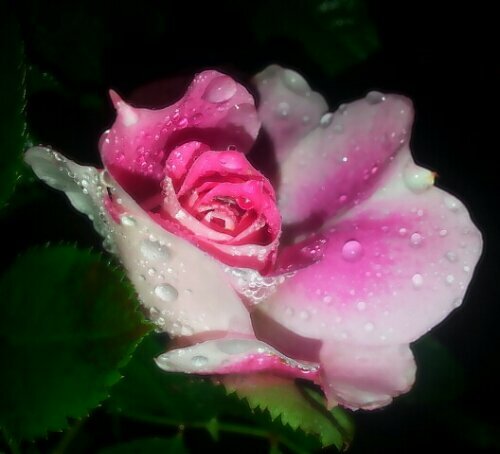 I can close my eyes and remember the scent of the Rose Perfume. Betcha Grammie has some dabbed behind her ears while yelling ” Bingo!” And yes, your garden is beautiful, I’m glad you didn’t get my black thumb. You don’t have a black thumb at all!! Someday when Haley is a celebrity and gets offered her own perfume (as they all do) perhaps Heather, Erin and I can help with production!